Subscribe now to receive 2016 event listings by e-mail! We had a great year — a fabulous concert in Boulder, the opening our new studio, a successful Summer Series, and the formation of two new ensembles. We’ve set down roots. We’re building towards large-scale productions of big head puppet operas and performances in public spaces for 2016. In line with our unique interdisciplinary vision, we continue to bring in experts in diverse disciplines to train local performers and stimulate cross-disciplinary creativity. Click here to contribute now. In January 2015, founders Mary Lin and Ben Sargent expanded an existing film studio into a 500-square-foot movement and music studio and new home for Inventing Earth in Longmont Colorado. 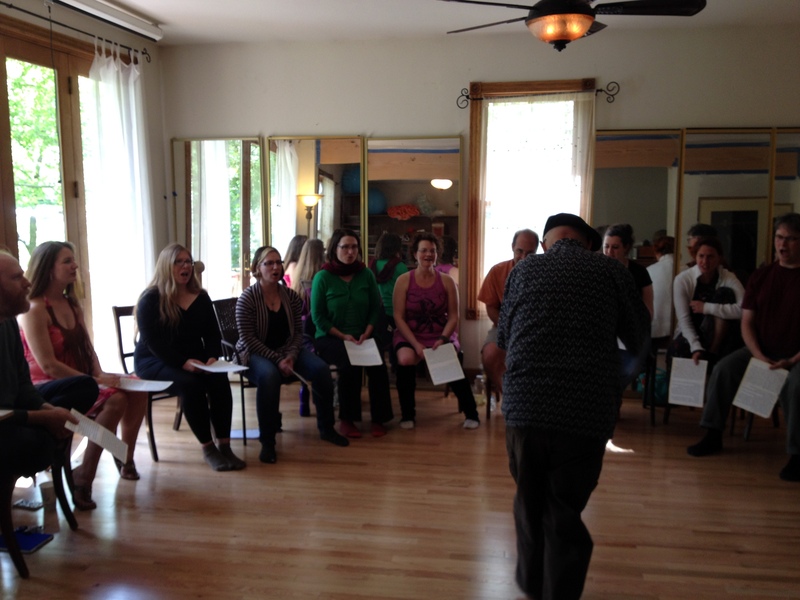 In May the Summer Workshop Series began. 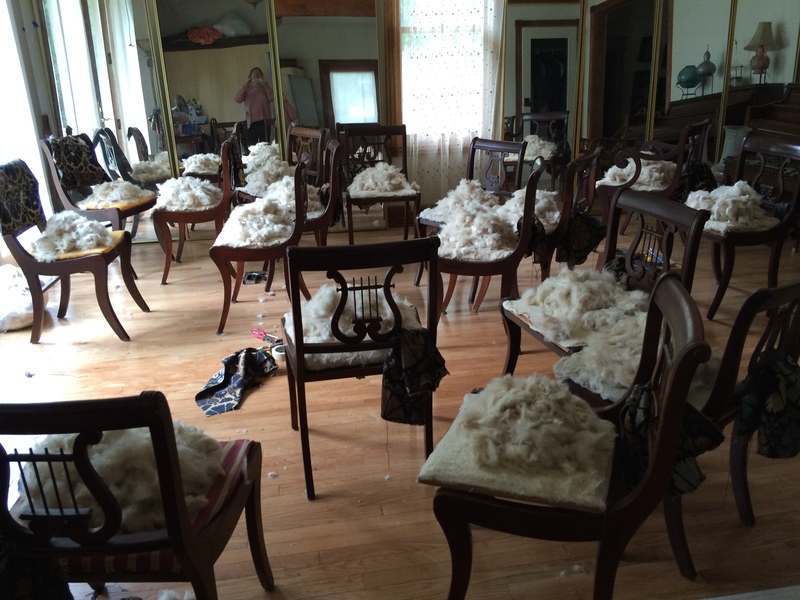 Just in time for the first Inventing Earth event in the new location, Ben and Mary crunched over a weekend to re-upholster seventeen vintage lyre chairs selected for the space. Conduction Workshops with Dino J.A. Deane took place on two weekends in May, both sessions were full and wonderful as professionally-trained musicians from many traditions collaborated and learned about this method of conducted improvisation that arose in the jazz world and has since bridged into classical and other world music traditions. The Flying Body Choir is a group of healers and performers who came together for the Conduction sessions and continued to meet monthly ever since, including three members of the original Flying Body Choir that formed in 2010 after Inventing Earth’s first summer series in Prescott, Arizona. The group is open to new members, contact Ben for details. 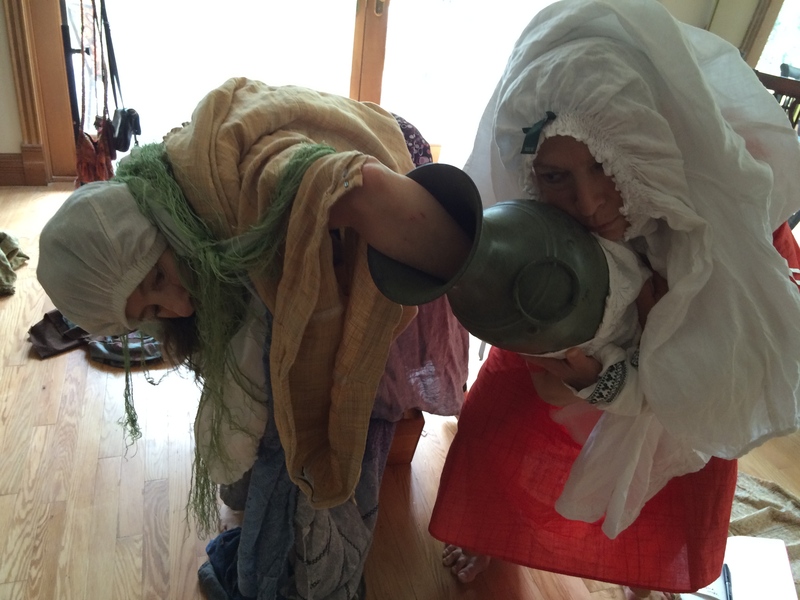 In June and July, a Collaborative Residency took place, called Railroad Alembic 1, with Erika Berland, Ethelyn Friend, Mary Lin, Colleen Mulvihill, and Leeny Sack. Meeting weekly over the course of two months, these veteran performers and teachers explored deep play for somatically informed practitioners, age 50+. 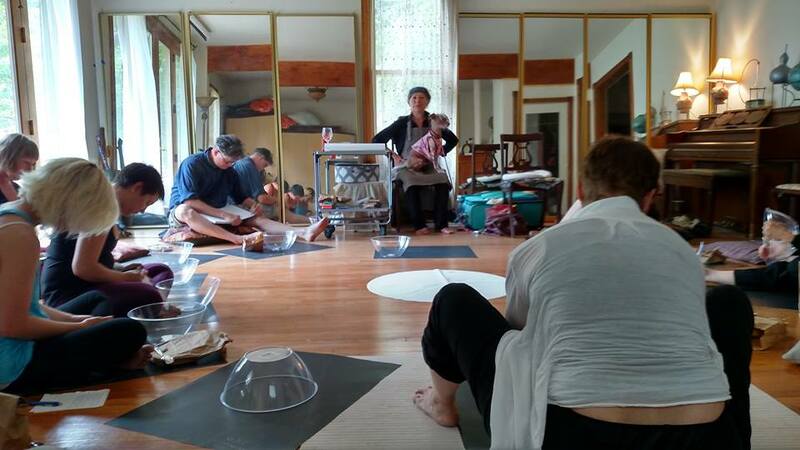 In June master performer and teacher Leeny Sack gave a workshop entitled “Object Theatre: self & thing (i/thou, i/it)” attended by professionally trained physical performers based in Colorado. In August Inventing Earth helped to organize, promote, and host the Denver area’s first Persian Classical Dance Teacher Training, bringing world renowned performer and teacher Shahrzad Khorsandi from San Francisco for a week-long intensive. Shokufeh was formed by a group of dancers following the Persian Dance Teacher Training sessions, organized by Krista Kimmel under the auspices of Inventing Earth. Shokufeh, which means “blossom” in Persian, is an ongoing training and performing ensemble focused on building new choreography of Persian-inspired silk road dance forms. An Awesome Award is the first result from our intensive grant-writing initiative, begun in September. Headed up by Dido Clark and Mary Lin, Inventing Earth plans to submit 20 grant applications by end of this fiscal year on June 30th. The Awesome Foundation funds will be used to make the big head puppets required for “Radiance – A Woman’s Tale” and to add to our growing collection for use in community events in Colorado. As of November 2015 Inventing Earth has four new Board Members, inaugurating a new chapter in our history as an organization. Click here to view Board profiles. Inventing Earth depends on individual contributions to carry out our mission of education through multi-disciplinary artistic endeavors. We rely on small contributors as well as large, because the grant-making organizations also ask how many individuals contribute. Inventing Earth is a federal 501c3 tax-exempt organization. Contributions are tax deductible in the U.S.